Tips for creating and manipulating planet textures for Celestia. realistic representation of Saturn, if not entirely scientifically accurate. Top left: Bj? ?rn Johnson? ?s original. Last: a blending of the "noise map" and the Cassini mosaic, together with some blurring filters and coloring. Below: a series of tests to determine "true colors" and visible detail. enough about the Ciclops imaging techniques to decide. to see if it helps. p.s. I think the last one is the best, too. selden wrote: I think the last one is the best, too. The question is how much contrast to introduce. Does this seem right? You are right: almost all the images shows these features in the infrared. texture, but on what level..
more than i about how to resolve infrared to visible light. I have a very hard time determining exactly what ought to be visible. map: the mosaic i have compiled is touch-and-feel and have huge holes. But i hope be able to make it more realistic. I don't know about realism either, but it definitely looks a lot more interesting with that kind of detail. 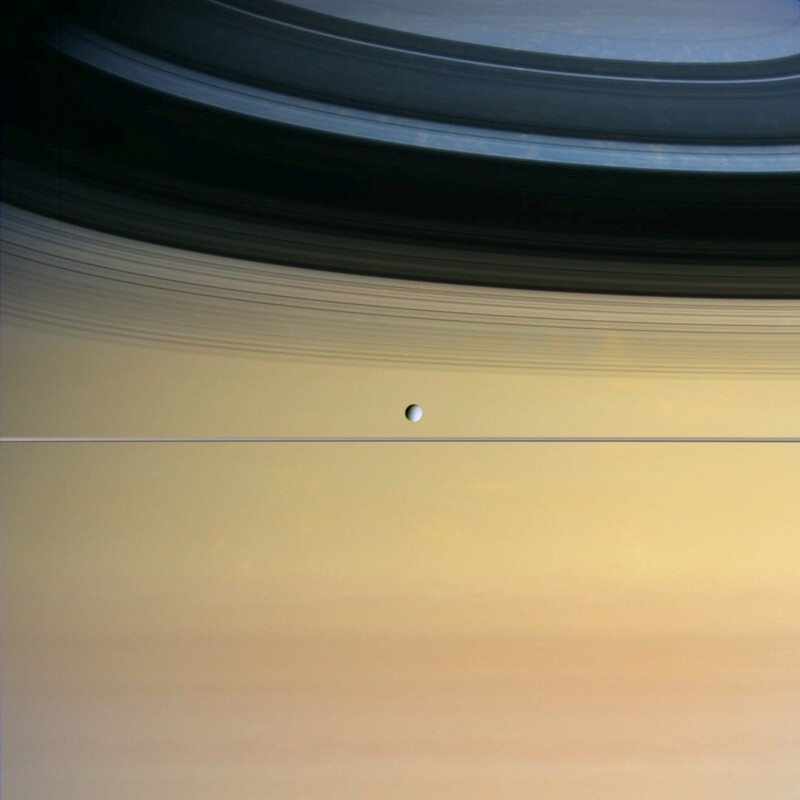 Personally I tried to make "my" Saturn a little more interesting by adding a very faint specular effect. In part to compensate for the lack of support of the haze for ATI cards. (I'm also trying something similar, yet more apparent with Venus. Its Atmosphere being so flat I was hardly caring about it even though underneath the clouds I placed that excellent VT by John VanVliet. I'm Thinking about disabling the atmosphere halo completely (since without the haze it would look particularly bad) and use the cloudmap with some specular effect added as the default texture for Venus. Then set a surface map as an alternate map). Anyway, in my opinion "test 3" image is a good compromise between richer detail from close range, and not too much noise from afar. 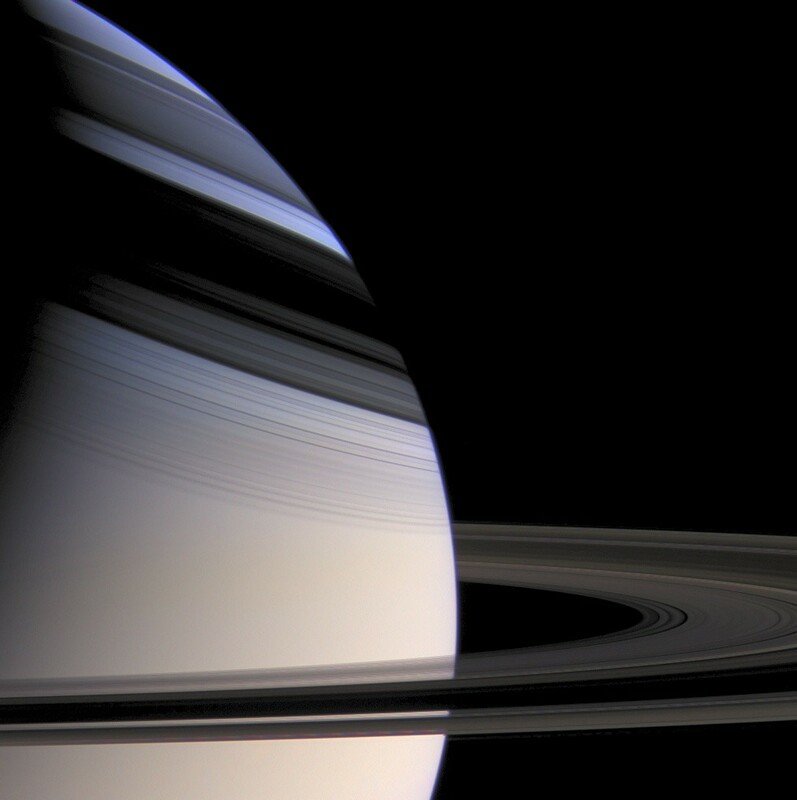 Giorgio wrote: I tried to make "my" Saturn a little more interesting by adding a very faint specular effect. In part to compensate for the lack of support of the haze for ATI cards. Giorgio wrote: in my opinion "test 3" image is a good compromise between richer detail from close range, and not too much noise from afar. Yes, i have it: it is quite striking. I am working on the colors, to get the "blue hat" in my one too. But before having anything to show, i have some texturing to do. inconspicous "noise" from different regions. do on the graphic for now! addition to the blue tint... Why did you choose this? Hi Fridger, I remember the thread about your Saturn texture and specular settings. As a matter of fact, I use your "blue hat" Saturn as the high-res setting in Celestia. It looks very good (definitely better than the standard texture) when the rings cast their shadows on the northern hemisphere. But, I'm afraid it may not be very realistic in any other condition, when, from the pictures I've seen, it appears like Saturn has more or less symmetrical colors for the two halves. Also I tried your specular settings last year, but it made the planet look like plastic, in my opinion. These are a bit more saturated than the previous ones, with a "hint" of the Blue Hat. I have also added Fridgers specular values, and enhanced the clouds with a very discreet 2k bumpmap. Could you be persuaded to use thumbnails in your post that link to the large images? Large pictures cause very long load times, especially for people with slow or even dialup network connections. Thumbnails will let the topic load quickly for everyone but still provide access to the high resolution pictures. I am on Runar's side. I will NOT do this with my images. t00fri wrote: I am on Runar's side. I will NOT do this with my images. I am nut sure how to respond to this, Selden... I certainly don? ?t want to make things difficult for anyone, and if this had been a regular discussion on any topic BUT graphics work, there? ?d be no question! But... This is ALL about graphics. That is the entire purpose. I knew it would become huge, so i labelled the thread with a warning. And i use my own bandwidth, so it does not slow down the forum... Isn? ?t that enough? Please consider. I? ?ll wait for your reply before posting more images. Again, I tend to observe an increasing "flatness" in the posts that appeared in the forum, recently. Very little substantial material anymore. 1) Hey my display is full of "red sprinkles", can you help? So I think we should be as receptive and grateful of any more "in depth" contributions with REAL SUBSTANCE"! That's why I am on Runar's side .